The world of pet insurance can be a minefield; policies contain financial jargon that is confusing and important terms are buried in the wording. 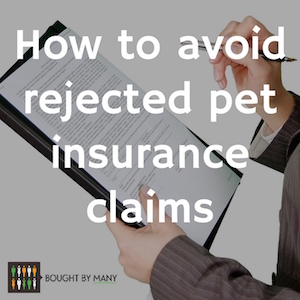 This can cause complications when it comes to making a claim and unfortunately catches many pet owners out. We want to put power back in the hands of pet owners! We’ve looked at the most common reasons why insurance claims are refused, to keep you one step ahead of the insurer. So, whether you are searching for a policy or in the process of making a claim, here’s a list of tips to help you make sure that your pet is covered and that you can claim when you need to. You can find out more about your insurance options with our guides to the best pet cover for dogs and cats. Or check out Bought By Many's unique pet policies. 1. Have you read the policy wording? You should always read the policy wording before taking out insurance. It is vital that you understand the terms and conditions of your cover and double check anything that is unclear with your insurer. Insurers include the definitions of important words in their policy documents. Be sure to read this thoroughly and don’t assume the meaning of certain terms based on their everyday use or your previous experience with another insurer. Once you’ve agreed to a certain set of terms it is very difficult to make a claim for something that is not included in them. Most UK insurers do not cover pets with pre-existing conditions. Check how the insurer defines existing conditions - the best case scenario is likely to be any injury or illness experienced during the two years before a policy is taken out, together with any related conditions. Chronic illnesses are almost never covered by new policies. If your pet does have a condition that you would like to be covered, you must check whether this is possible with the insurer first. Bought By Many has just launched the first pet insurance cover for pre-existing conditions. For more information, check out our Pre-Existing Medical Conditions policy. Pet insurance often does not kick in for the first 14 days, which is known as the "exclusion period" or "waiting period". While this gives you the chance to change your mind about a policy, it also means that you won’t be able to make a claim during the first two weeks. Insurers should let you select a start date, either the day you pay for the policy or some point in the future. If the official start date of your policy is not clear, be sure to double check with your provider. There are a number of treatments that most insurers will not cover, including vaccinations, spaying, neutering and pregnancy-related issues. You will have to pay for these basic treatments and some insurers will require them as a condition of their cover. If you’re insured with Petplan, for example, your dog must be vaccinated against distemper, hepatitis, leptospirosis and parvovirus. And cats must be vaccinated against infectious enteritis, cat flu and feline leukaemia. If they aren’t vaccinated against these and develop a related condition, Petplan may refuse your claim. 5. Do you know about the 12-month limit? The 12-month limit refers to the period you can claim for a specific condition under annual pet insurance policies. Insurers may use different names to describe these types of policies, for example "Basic", "Economy", "Essential", or "Bronze", so it's important to check. Here's an example of how it works: if you make a claim for a dog suffering from cancer and your insurer pays out, you will be allowed to continue making claims relating to the condition for up to 12 months or up to your vet fee limit. Once you've reached 12 months from the claims, cancer will be excluded from the policy and you won't be able to make any more claims relating to it. Many companies offer lifetime policies, which allow owners to claim for a condition throughout a pet's life. With a lifetime product, it is important to note that your premiums will increase each year at renewal. This is different to a “Per Condition” policy, where a particular condition can become excluded once the condition limit is reached. As your pet gets older your excess is likely to increase, too. Annual policies with 12-month limits are likely to be cheaper than lifetime policies but can cost owners more in the long term if they have to pay for treatment that has been excluded. 6. Does your pet need dental cover? Dental cover is not always included as standard in pet insurance policies. If your pet needs dental care, be sure to clarify whether it is included or an optional extra before purchasing a policy. Learn more about which companies offer dental cover for pets. 7. Is your pet the right age? Most insurers have minimum and maximum age limits for pets to qualify for cover. If you are not sure about your pet’s age it is possible to get an estimate from your vet. Minimum age requirements might only be a few weeks for dogs but the maximum age limit can vary between insurers and breeds. Generally, it can be tough to get cover for dogs over seven or eight years old. We've listed some of the providers that offer cover for older dogs here. 8. Exclusions for pets used for commercial purposes? Most insurers will not cover pets used for commercial purposes. That includes security, track racing, breeding and more. If you are unsure whether your pet will fall into this category, make sure that you double check with your insurer. It is possible to get specialist liability policies for working dogs. Find out more here. Tell your insurer about any changes to your pet’s circumstances. This includes moving house or even changing owners. Your insurer must be aware of your pet’s details because they can affect your premium and ability to claim. If you believe that your claim has been unfairly refused the first step is to file a complaint through your provider. If this is rejected, you can take your claim to the free Financial Ombudsman Service . To find out about the Financial Ombudsman’s approach to insurance check out their website. You can also find more advice on how to deal with a rejected insurance claim on the Citizens Advice Bureau website. Check our guides to the top 10 pet insurance companies for dogs and cats.